You are at:Home»Society»Crime»February 2, 1935: Are Polygraph Tests Admissible in Court? February 2, 1935: Are Polygraph Tests Admissible in Court? On February 2, 1935, Leonarde “Nard” Keeler testified about polygraph evidence in a Wisconsin courtroom at a trial of 2 men for assault, the first use of the polygraph, often simply called “the lie detector,” in court. Then, as now, debate about the efficacy of the polygraph was fiercely defended on both sides. Keeler was the co-inventor of the polygraph, a machine that measures bodily functions in response to questions being asked the subject of the test, the reaction of those functions supposedly indicating whether the subject is telling the truth or a lie. Bodily functions tested usually include factors such as blood pressure, heart rate, respiration and galvanic skin response. These functions are monitored for “arousal,” a response believed by the inventors and proponents of polygraphs to indicate the subject is lying. Unfortunately for those proponents, these physical responses are not consistent among people and especially inconsistent between different ethnicities. Many Middle-Eastern people will regularly pass polygraph tests even while blatantly lying because they feel no anxiety or shame about lying. People brought up to always tell the truth and that are afraid of being found out as liars are most susceptible to having those physical indicators spike when lying. The downside of being an inherently truthful person when being tested is that anxiety may show a false “lie” response even when telling the truth. Many instances of murderers (such as the “Green River Killer”) and spies beating the test are rampant, but are countered by successful tests finding perpetrators and spies when those people were not even seriously suspected. Both sides of the debate tout their successes and the other side’s failures. Various forms of lie detectors, including polygraphs, are often used for screening prospective new employees (such as in police or other government jobs) and are often used in screening people for security clearances. Many secret agencies (CIA, FBI, etc) give periodic polygraph tests in an attempt to catch their employees nefarious activity before there is a reason to suspect the employee of wrongdoing. Are the polygraph tests accurate? In a word, sometimes. Many people can beat the test without any preparation, and many others can learn through practice and techniques of ways to beat the test. Others indicate they are lying even when telling the truth, while people with mental issues, autism, and other physical or psychological issues cannot reliably be tested. Of course, for many people, the tests are a pretty good indicator of truthfulness vs. deception, but which people? The skill of the polygraph operator is the key to the validity of the test. The operators that are trained interrogators can psychologically manipulate the subject by pretending the machine shows “a little problem with your last answer” to evoke elaboration on a subject or an inadvertent revelation in a “fishing expedition” type of interview. Nervous people are highly susceptible to being manipulated into blurting out truths and admissions under the intimidation of the machine combined with skillful interrogation. So, are polygraphs admissible in court? Sometimes. Some states (19) allow limited application of polygraph evidence, but that evidence must be supported by other evidence to amount to evidence that can lead to a conviction. Sometimes the polygraph evidence is used to validate a search warrant or further inquiry, but by itself is not considered proof of guilt or innocence. Scientists are split about 2 to 1 against polygraphs as a valuable lie detecting tool, and most think further research into brain and body response to lying vs. truth telling is needed. Other forms of lie detecting (besides torture!) exist, such as computer voice stress analysis (CVA), Functional Magnetic Resonance Imaging (fMRI), and reaction time (RT) type tests face similar debate and problems to using polygraphs as lie detectors. Even studying posture and physical body language is taught as a form of detecting lies, and facial expressions may also have some correlation to truth vs. lie. None of these methods are foolproof! Not even the handheld portable units issued to our soldiers in Afghanistan to test the truthfulness of Afghan people right at the scene of being interviewed! What do you think? Are polygraphs reliable enough to warrant their use in court testimony? 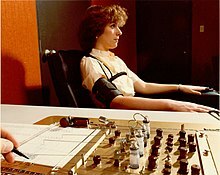 Please share your tales of polygraph experience and your opinions on what, if any, use they have in our society. Alder, Ken. The Lie Detectors. Free Press, 2007. Bunn, Geoffrey C.. The Truth Machine: A Social History of the Lie Detector. Johns Hopkins University Press, 2012. Previous ArticleFebruary 1, 1796: Why Was “Upper Canada” the Southernmost Part of Canada? Next Article Why is Innovation in Fashion Indispensable?